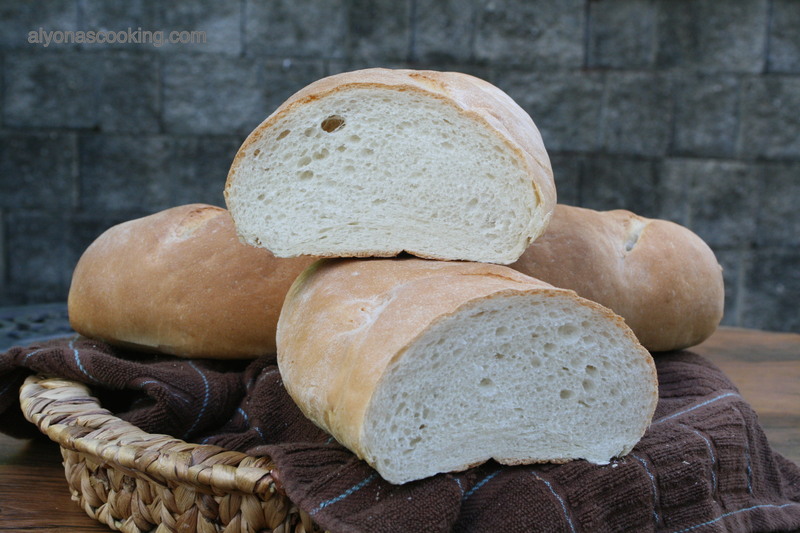 Have you ever wondered how to make that delicious white fluffy italian bread from the grocery store? Well this is pretty close. 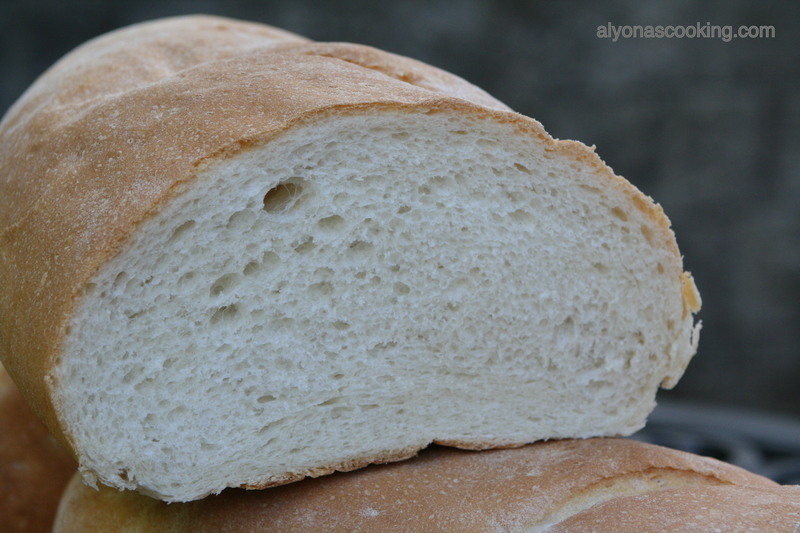 Super soft and fluffy interior, nice brown crust on the exterior = amazing bread. 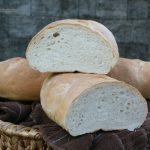 These loaves go very quickly at my house and the good thing is this recipe is very easy to follow. I highly recommend a stand mixer or a bread machine to prepare the dough as you may achieve very fluffy results where as if you were to knead by hand. I have tried all three methods and seem to like the bread machine method a lot (just throw all ingredients in and set on dough settings. 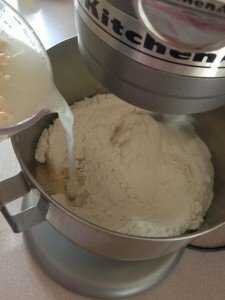 I don’t know how the bread machine kneads this dough but it comes out fluffy and delicate) but since not everyone can own a bread machine I wanted to share the mixer version which works well too. Enjoy! 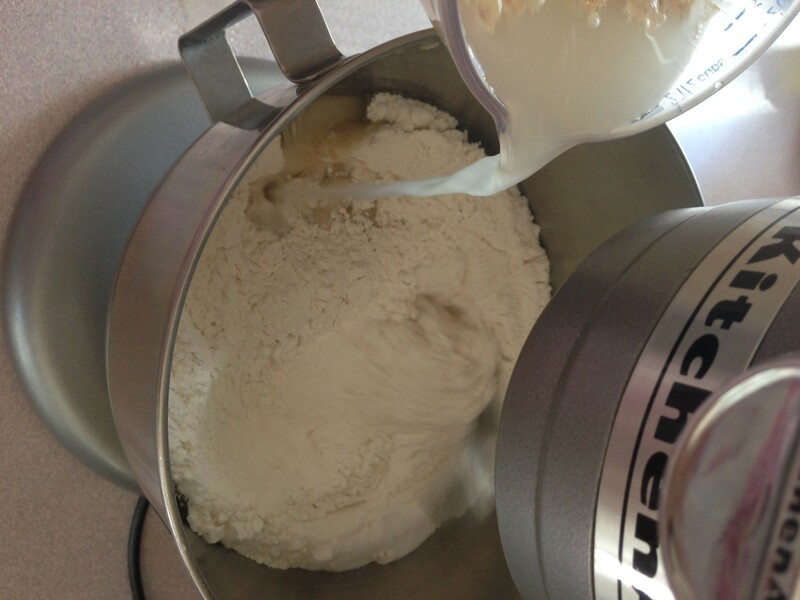 Dissolve the yeast in warm water and let sit a few minutes.Throw dry ingredients in the bowl of your stand mixer. Add the yeast and oil to the flour and knead on low-speed for about 7 min, adding more flour as needed until dough no longer sticks to the sides of the bowl. Cover bowl and let rise for about an hour or until dough reaches the top of the bowls rim. After rising time; remove the dough from the bowl and transfer to a lightly floured surface. 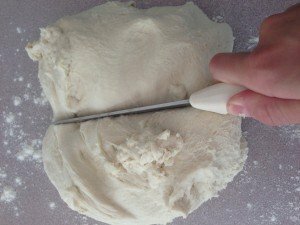 Cut dough in half and form each piece into an oval shape pinching down the bottoms. Roll into a log (about 14.5″ long and 3″-4″ wide) pinching down sides as you go. 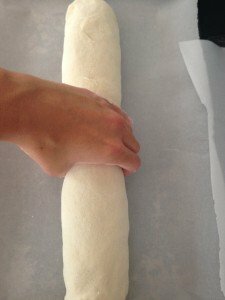 Transfer the rolled logs into two medium-sized baking sheets lined with parchment paper (I used 2 15″ by 10″ baking sheets). Tuck bottoms of the loaves in aligning the log and shaping well on the baking sheet. Allow to rise for about 45 min. 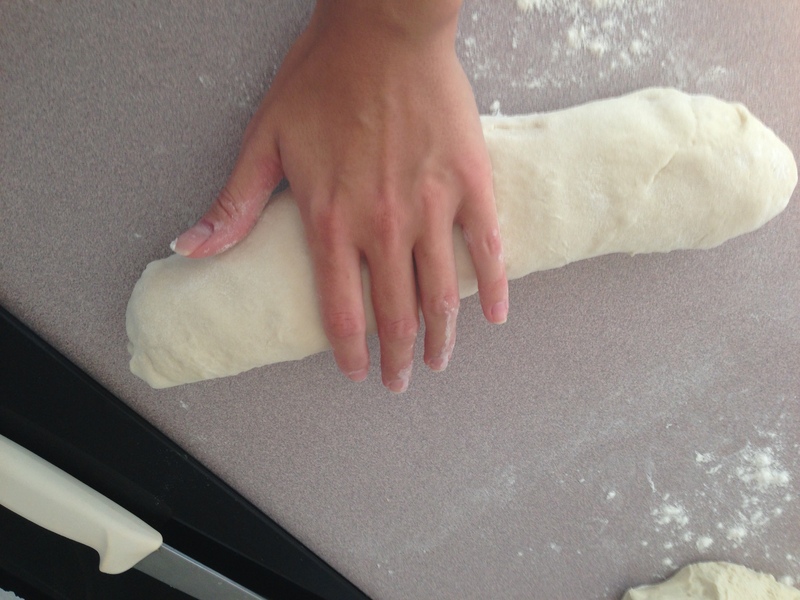 Dough should double in size. Then preheat the oven to 410 degrees F and cut the tops of each loaf using a sharp knife, making slanted dashes. Allow to rise for an additional 15 min and then bake for 20 min. Remove bread from oven and place on a cooling rack. Cool completely before slicing. Enjoy! Dissolve yeast in water and let sit a few minutes. 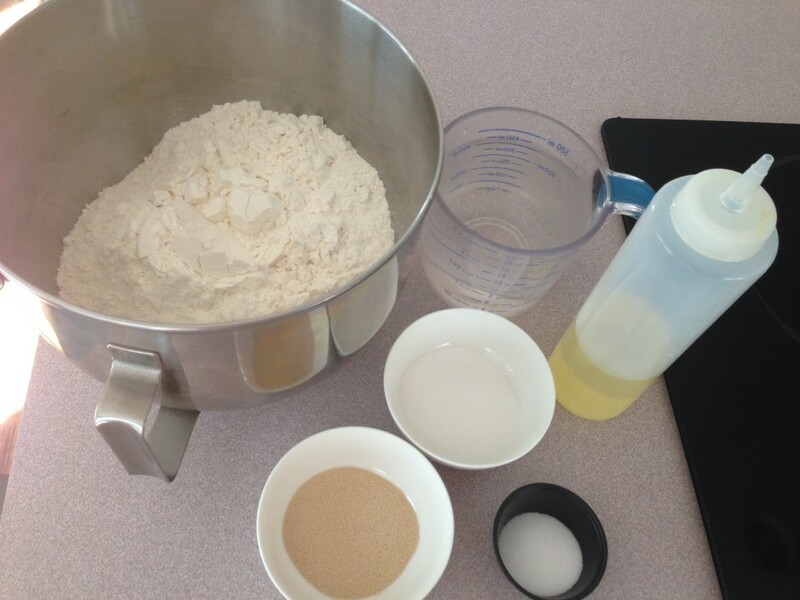 Place 5 cups of flour, salt and sugar into the bowl of your stand mixer. Put on the hook attachment to your mixer and add the yeast mixer and oil while the mixer is running on low speed. Knead for 7 min adding more flour as you knead until sides no longer to to the sides and dough has formed into a ball. I used about 5 cups of flour and a little for dusting sides of the bowl. Sometimes I use more flour depending on what flour I use, so it really depends. Cover and allow to rise for about an hour or until dough has reached the rim of the bowl. Remove dough from the bowl and transfer to a lightly floured surface. 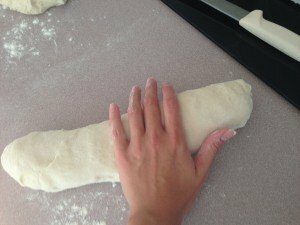 Cut dough in half and form each piece into an oval shape pinching down bottoms. 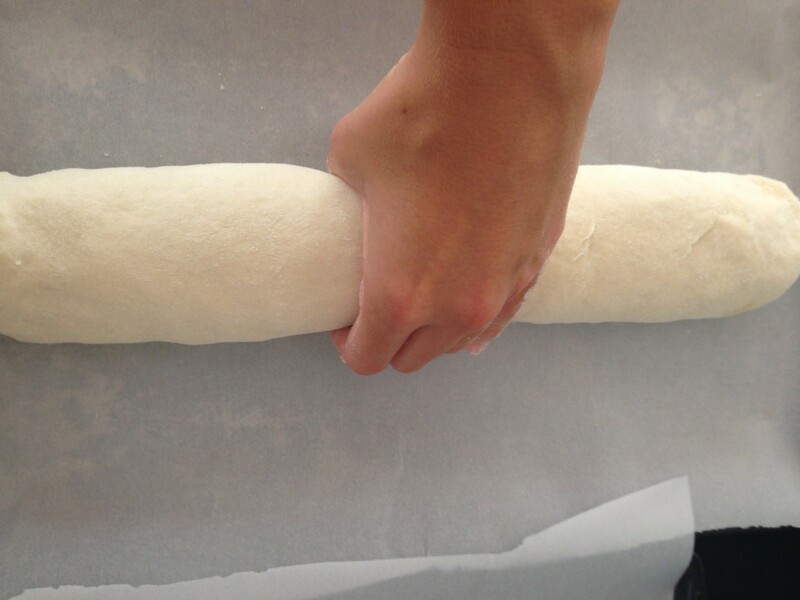 Roll out into logs approx 14.5" log by 3"-4" wide and transfer to lined baking sheets. Fix and shape the logs on the baking sheets pinching down dies and ends. Allow to rise on baking sheets for about 45 min. 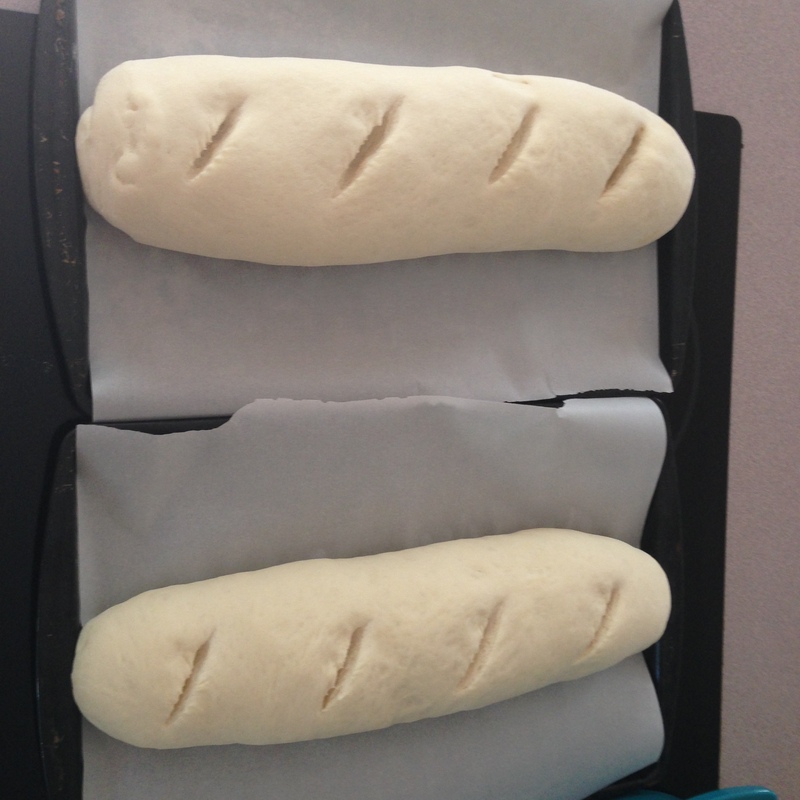 Then preheat oven to 410 degrees F.
Cut slanted dashes on the tops of loaves and allow to rise an additional 15 min. Bake for 20 min; remove and cool on a cooling rack. Enjoy! Great recipe my family loved the results! Glad I stumbled upon it. Where is the oil used? This recipe is almost perfect. Very tasty and the bread was soft. Only issue is it’s too salty. Making again, but cutting the salt down to 2 tsp since this makes 2 loaves. I’m so glad I found this recipe! It’s definitely a keeper! Thanks Melinda, It’s definitely a go-to bread recipe I like to alter at times aside from my favorite wheat bread recipe. Regular all purpose flour will work for this recipe? Just made this bread and it turned out amazing. Will definitely keep this recipe. Thank you. Thank you Tania! This bread goes quickly at my house, we really enjoy this bread!